The big line items on the stat sheet said Virginia lost by 10 points. The ‘Hoos shot 39.4 percent, and Duke shot 48.2 percent. Duke had a 44-31 advantage on the boards. Marvin Bagley III was better than advertised, with 30 points and 14 rebounds. Only two stats were in UVA’s favor: turnovers, and the final score. Duke committed 16 turnovers on its 66 possessions. That 24.2 percent rate is slightly higher than what the Cavs have been able to do on the season, forcing turnovers on 23.6 percent of opponents’ possessions, good for 11th nationally, according to KenPom.com. Virginia had just five turnovers. And yep, in case you were wondering, that’s also par for the course. UVA’s turnover percentage is 14.9 percent, seventh-best nationally. The line item for points off turnovers: Virginia 14, Duke 4. That is, give or take, how a 10-point loss turns into a two-point win. One other item stood out. Duke, as was mentioned already, had a 44-31 advantage in rebounds, and had 12 offensive rebounds, with an offensive rebounding percentage of 36.4 percent, just off their nation’s best 39.3 percent season average, but still pretty close to elite. But in terms of converting those extra chances into points, well … the second-chance points line was interesting. It had Virginia with a 12-10 edge, as the ‘Hoos had 10 offensive rebounds on their end, and all 12 of those points for Virginia came in the second half. The pace split the difference. Virginia came in averaging 59.9 possessions per game, Duke 72.1. 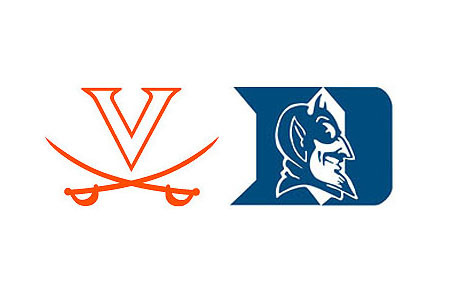 Duke had 66 in this one, Virginia 67. If anything, the game played at a slightly Duke-favored tempo. Some more fun with stats: as was mentioned, Bagley had 30 points, on 13-of-18 shooting. Fellow big man Wendell Carter had 14 points and 15 rebounds on 6-of-11 shooting. Bagley and Carter had an edge largely because of the curious foul trouble of Isaiah Wilkins, the nation’s best-rated defender, who on Saturday suddenly forgot how to play defense without fouling, getting just three minutes in the first half before going to the bench with two fouls, and logging just 14 minutes on the game and finishing with four fouls. Without Wilkins, Virginia coach Tony Bennett had to go a lot more than he wanted to with 6’7” freshman guard De’Andre Hunter in the post guarding Bagley. Hunter played 24 minutes, did his best against the guy who will be the number one pick in the June NBA draft, and at least was able to contribute offensively, putting in 12 points on 6-of-13 shooting, and finishing with a team-best plus-minus of +11. The bigs for Duke did what they did: 44 points, 29 rebounds, 19-of-29 from the floor. The guards did next to nothing. Trevon Duval, Gary Trent Jr. and Grayson Allen were a combined 8-of-26 from the floor with 10 turnovers. It was so bad for the Duke guards that Bagley and Carter had three of the team’s four makes from three-point range. The guards were just 1-of-8 combined. That’s how you win a game on the road against a lineup of NBA first-round draft picks with the nation’s best defender curiously sidelined with odd foul calls, an 18-9 disadvantage in fouls until the opposition needs to send you to the line for clock purposes, and all of those other stats lined up against you. You take care of the ball, you take advantage of mistakes by the opponent. It’s why one-and-done teams like Duke, like Kentucky, with all the talent in the world, have a total of two national titles in the 12-years-and-counting one-and-done era. It’s veteran teams like Virginia, like Villanova, like North Carolina, whose coaches don’t just roll the ball out and have their kids go play, that are their kryptonite. Anyway, yeah, Marvin Bagley III is the top draft pick, and whoever gets him gets the next LeBron James. But his team lost today.